This is Rita and this is my second string quilt. I started this quilt way back in March, and I thought Memorial Day weekend was a good time to finish it up. It measures 52 x 66 inches so it's a fairly good size. I’ll be donating this quilt to the Quilts of Valor program. It all began with a pile of strings in patriotic fabrics that I’ve had for years. I still have a bunch left so I’ll be making another string quilt to use them all up … finally! 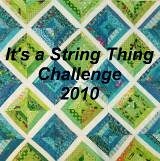 Seems everyone enjoys making these string quilts as much as I do. I just love seeing all the projects ... they're all so inspiring! I really like this idea for a patriotic quilt! Mind of I steal the idea? Very nice! What a great quilt! Looks like you had the same roman stripes inspiration that I did. And the Quilts of Valor is such a super charity. You have just inspired me to make one for them too! Thanks. Love your string. Great job!! What a great red white and blue quilt.